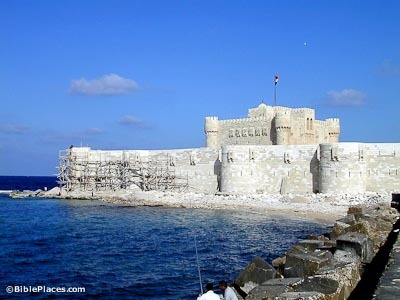 Fort Qaitbey was built in the 1480s by Sultan Qaitbey, on the site of Alexandria’s ancient lighthouse, parts of which can still be seen in the construction of the old fort. As one of the seven wonders of the ancient world, the lighthouse was 400 feet (125 m) tall with approximately three hundred rooms at the bottom for workers. Today these ruins are 20 feet below the surface of the water. Either this part of the city sank, or this city was flooded by a tidal wave after the earthquake of AD 335. The ancient lighthouse of Alexandria, the Pharos Lighthouse, was one of the seven wonders of the ancient world. Built in 279 BC by Ptolemy II, the lighthouse rose to a height of 300 to 500 feet, the equivalent of a modern 40 story building. The first building to surpass it in height was the Eiffel Tower in 1889. Remains of the lighthouse have been discovered in the waters of the harbor. The royal palaces that were once the homes of Cleopatra, Julius Caesar and Mark Anthony have also been found. The work of excavating is difficult because these buildings cover more than 5.5 acres, a tremendous amount of area to excavate under water. Pompey’s Pillar is a 80 foot (25 m) red Aswan granite column with a circumference of 30 feet (9 m). It was originally made in honor for the Emperor Diocletian at the end of the 4th century AD. After Julius Caesar defeated him in the Civil War, Pompey fled to Egypt and died in 48 BC. Accordingly, a legend appeared claiming that Pompey was born there and that his head was in the capital on top of the pillar. 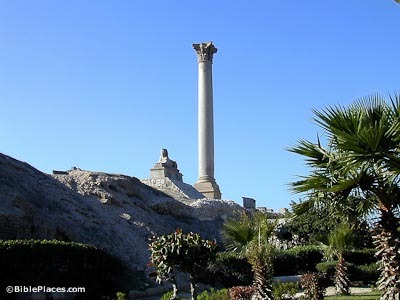 The pillar is the largest ancient monument in Alexandria. Excavations uncovered a Roman theatre (2nd century AD) with galleries, sections of mosaic flooring, and marble seats for 800 spectators. In the time of Ptolemy, the surrounding area served as a Park of Pan and a pleasure garden. 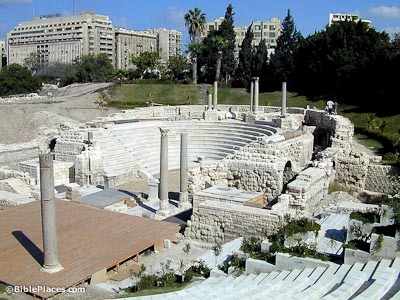 The theatre might have been roofed at one point to serve as an odeon for musical performances. The catacombs were carved in the 2nd century for one wealthy family still practicing the ancient Egyptian religion. These tombs represent the last major construction project for the sake of the old Egyptian religion. Once a major center of Jewish life, today Alexandria is home to only one synagogue and a few Jews (the youngest is in his 60s). 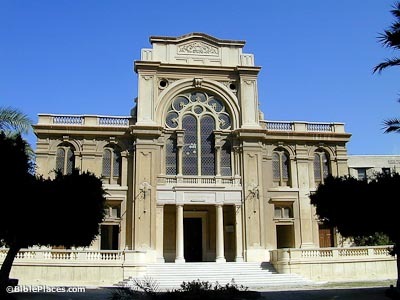 Before World War II, 40,000 Jewish people lived in Alexandria and there were 16 synagogues. Persecution has forced most to flee, and today the synagogue at right which seats 1,000 does not even have a minyan (10 men) to pray on Shabbat. The Eliyahu Hanavi synagogue is one of the most beautiful synagogues in the Middle East. 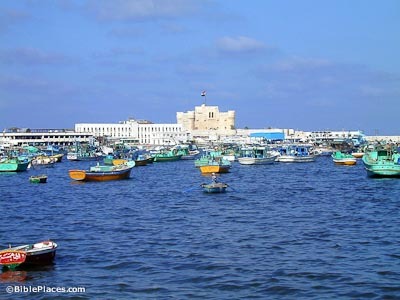 The City of Alexandria, Egypt (Tour Egypt) Provides a vast amount of information about the modern city and its attractions. Alexandria (Encyclopaedia of the Orient) Briefly describes the modern and the ancient cities of Alexandria and provides a summary of the city’s history. Also contains a few pictures of the city. The Ptolemies Age (Alexandria: The Pearl of Mediterranean) Describes the history of the city from the time of Alexander the Great to Cleopatra, and offers links to similar descriptions of the Roman, Christian, and Islamic periods. Also features several photographs of the city here. 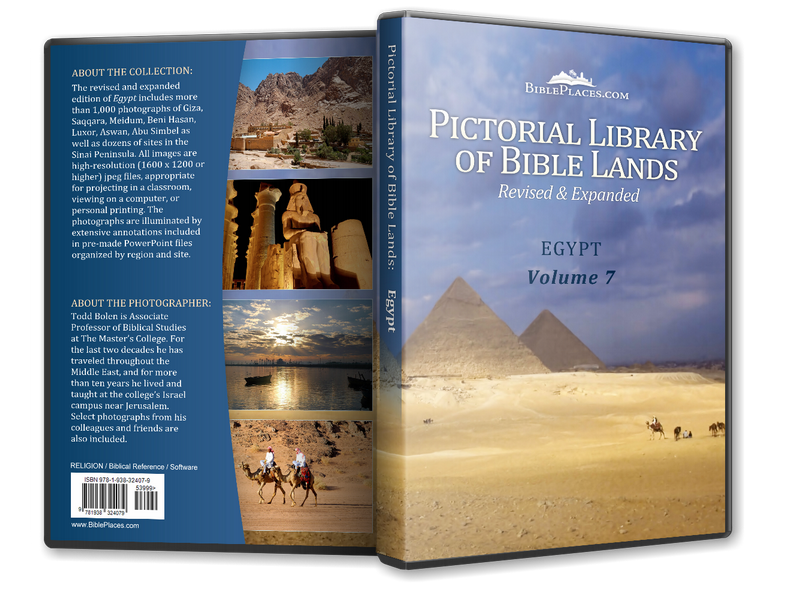 The Lighthouse of Alexandria (The Seven Wonders of the Ancient World) Describes the location, history, and features of Alexandria’s lighthouse, one of the seven wonders of the Ancient World. Alexandria: The submerged Royal Quarters (Franck Goddio) Features pictures, maps, mission reports, and other information about the underwater excavations in Alexandria. Alexandria (Galen Frysinger) Provides various photographs of the city and links to further pictures of the Roman theater, Pompey’s Pillar, and the new library. Alexandria, Egypt (GEsource World Guide) Displays a satellite image of the city and its harbors. 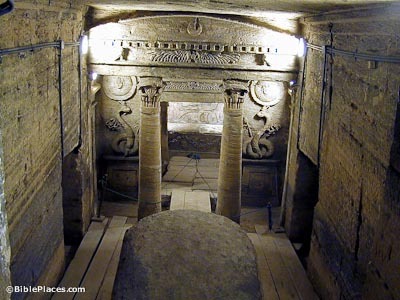 The Catacombs of Kom el Shoqafa (WonderClub.com) Photograph and description of the catacombs, credited to National Geographic.